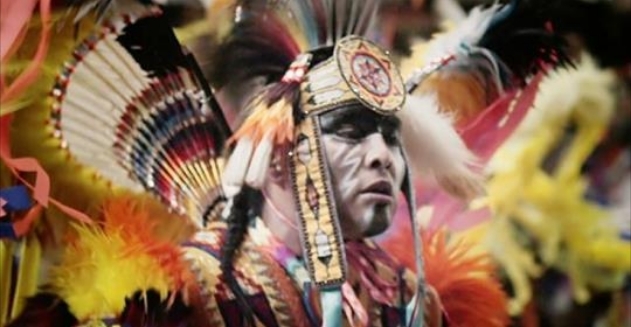 Every year, the Gathering of Nations brings more than 700 Native American tribes to Albuquerque for a cultural heritage celebration. Stepping in a clockwise spiral, dancers fill the arena in a colorful swirl of traditional dress. Drum groups sing as they play thunderous rhythms that dancers instinctively anticipate. The ringing of thousands of bells and rattles affixed to dancers accentuate every step. More than 3,000 participants, representing all 565 U.S. and 220 Canada indigenous tribes, enter the Tingley Coliseum at the New Mexico State Fairgrounds. Billed as the largest such event in the world, the powerful Gathering of Nations Powwow in Albuquerque is felt as much as seen and heard, the percussion aligning tens of thousands of heartbeats in the audience during the two day annual event. The Gathering of Nations began in 1983, when University of Albuquerque Dean of Students and club advisor Derek Mathews organized a powwow for his many students. The university closed the following year, but word of mouth spread about the powwow. “It started as a way for our Native American students to share their cultures and feel closer to home,” says Mathews, now executive director of Gathering of Nations. “It was a unique opportunity to bring people from tribes all across the country and Canada together. Responses to "Experience the World's Largest Powwow: Gathering of Nations"